To be honest, I never intended to go to Bali in my entire life. If it wasn’t for this Indonesian waiter that proposed to me at 17 and asked me to live with him in his newly constructed house in Bali (a story for yet another time), then I probably wouldn’t be able to point Bali out on a map. I was completely unfamiliar with that area of Southeast Asia and now, I thought, it was a prime opportunity for learning. I wanted to escape for the National Holiday in China, and I wanted to go somewhere new. Somewhere with nature and far away from the pollution and noise that is Shanghai. I haven’t been to Thailand or Cambodia yet and thought it might be affordable, but after looking at tickets departing from Shanghai to Phucket, Bangkok–even Laos, I shrieked. How are prices that high even humanly possible? After scouring the net for ages, the best deal I could find was Bali. 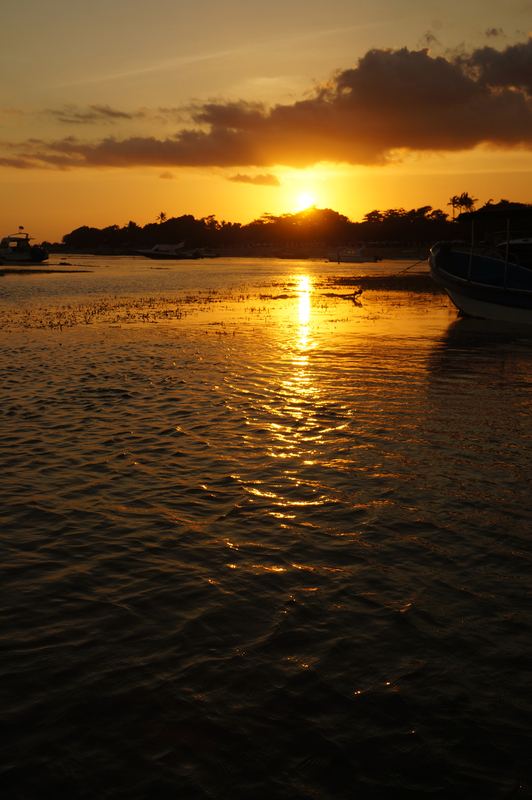 Takada-san, my boss, said she had been to Bali 6 times and recommended it like no other place on Earth. So call it fate. Call it a stroke of good luck. But thanks to the right ticket and timing, I found myself on a solo journey to Bali. I won’t bore you too much with the usual platitudes of R&R on Bali, so let’s just get to the good stuff. After walking uphill, meandering through this back alley alongside a river on some, well, quite unreliable concrete, I had finally made it to my destination: Nirwha Homestay (Highly recommend this homestay, simply excellent). And I wasn’t missin no funeral party. The mom dressed me up in a sarang (it’s disrespectful not to wear one to a funeral) and I was off with the American and the host dad. 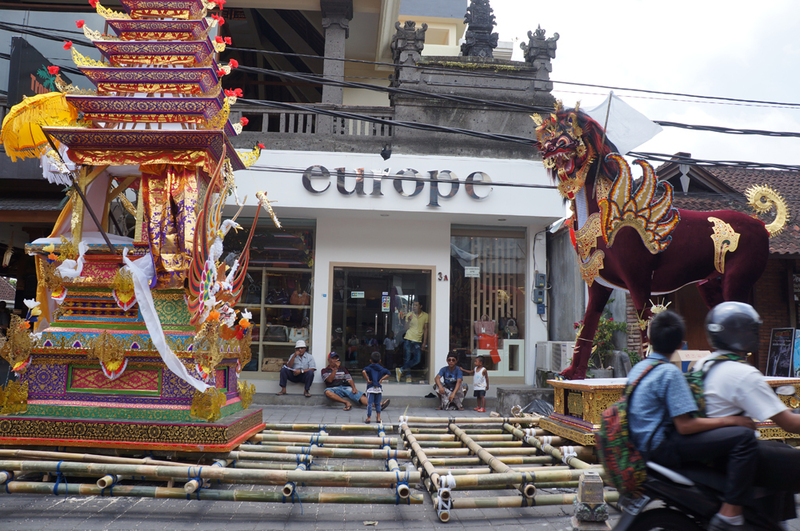 After walking a few minutes and arriving at downtown Ubud, I laid eyes on two random objects on the road: a model of a temple and a horse resembling a parade float ala Macy’s Thanksgiving. Imagine gongs, cymbals, and drums all clashing together with infused chanting, while foreigners and locals alike spill into the main street, blocking off traffic and joining in on the funeral festivities as the body floats through the crowd. When the body comes out, the music volume goes up a notch and the crowd goes wild. They load the body onto the temple shaped “float,” then order all of the young men to lend their shoulders and cart the horse and temple float across town, Japanese-mikoshi style (aka, transportable temple). With over 50 men supporting each float (they were heavy, not to mention there was a body on one), the crowd starts to scream and shout in excitement, and the floats begin to move. Everyone, and I mean EVERYONE began following the body and its horse. All of us soon joined in this bizarre parade and marched uphill. 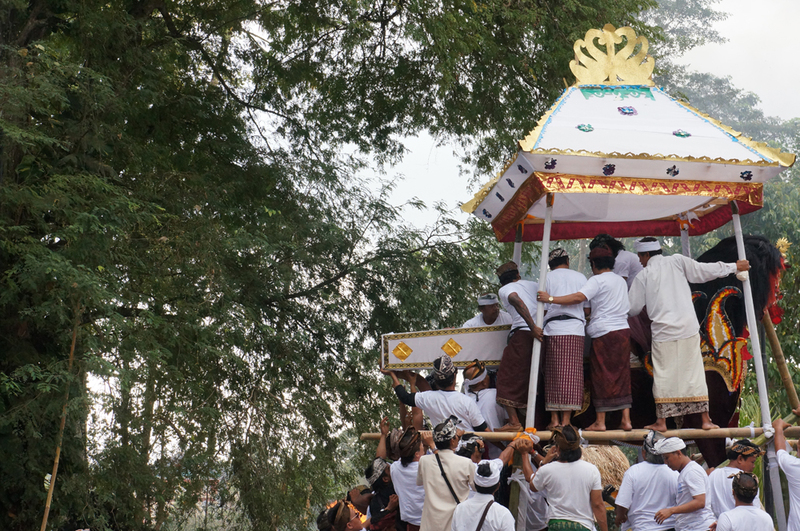 After chanting to banging cymbals and filing through the streets of Ubud, the float, its carriers, the musicians, and all the hundreds of thousands of followers finally reached our destination: the cemetery. The portable shrine and horse float were set in the middle of the cemetery, which was shaped like a plaza surrounded by a jungle of trees. All the hundreds of followers sat down on the stone floor, while vendors began to make their rounds selling balloons, ice cream, candy and other bento-box type lunches. Needless to say, I was experiencing an ultimate state of culture shock. 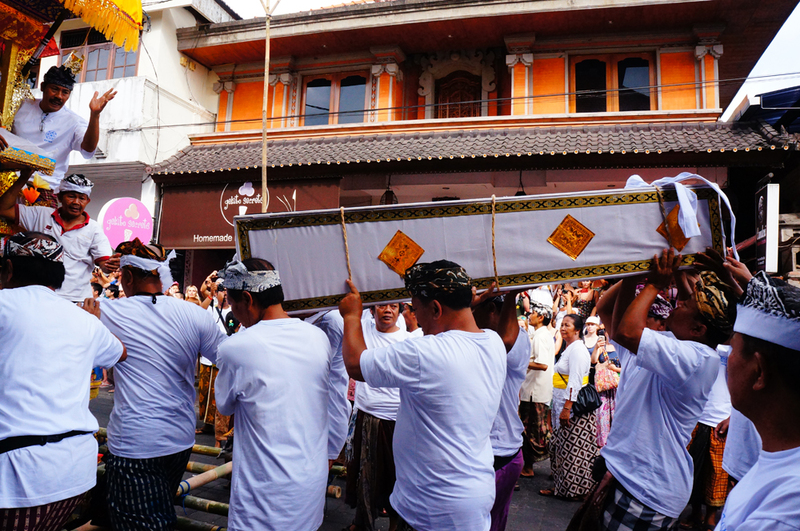 This was a funeral, but instead of ‘mourn’ the Balinese were celebrating–no, they were having an all out festival. Kids were running around the casket clutching ice cream cones and laughing, the old women beside us were smiling and giggling amongst themselves, offering us foreigners oranges and other fruits as a snack to enjoy the festivities. I looked to the shrine to see them unlatching the casket and actually take out the body. The family and the Hindu priest gently carried the body to the horse and placed it inside. They began to pour different oils and offerings, flowers and fruits inside the horse, sending the deceased into the afterlife with an assortment of goodies and presents. I watched in awe, and I felt a heavy weight on my heart. The deceased was a young man, no older than 18, and he died in a car crash. He had his whole life to look forward to, and it was gone. 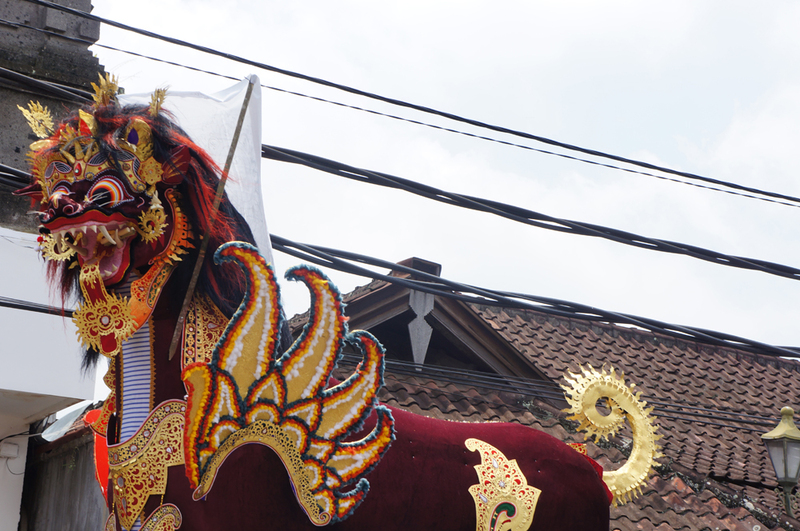 But to the Balinese, his ‘new life’ was just beginning. I stood up from my stone seat on the floor and inched closer to the horse. I examined all of the glittering silver and gold ornaments and offerings placed his diety, and I saw his family nearby praying, the priest also chanting. They began to douse the horse in kerosine, and the priest was the first to throw a burning tree branch at the horse. It immediately erupted into flames. His family also added to the fire by gently placing more wood onto the pyre beneath the horse. The red horse was slowly turning black, and the flames began to engulf not only the horse, but the body inside. I was frozen. I don’t know what hit me, but I was transfixed onto this macabre scene. I moved in even closer, intently looking at the licking flames devouring the horse and eating away at his inner organs–in other words, the young man’s body. I have never been to a funeral, much less seen a cremation–or a public cremation, at that. The burning funeral pyre before my eyes petrified me, froze me, captivated me. My heart and mind were filled with contradiction. It was a heavy moment for me, but it was like the entire world around me was ignoring the fact that death was everything but sad. While my heart felt sadness, the people around me felt joy. I knew they weren’t doing it for show–they honestly thought it was a celebratory thing to be killed and go on to the ‘next stage.’ It was the first time that I’ve ever had such a difficult time trying to put myself in another culture’s shoes. Nothing about the scene clicked with me, and while my mind was trying to understand it, I doubt my heart ever could. Seeing a life burn away, falling away from the horse piece by piece into the flames below, had me think about the fragility of our bodies. Of how precious and short life really is. Seeing death is hard for me. When the flames crawled closer and closer to parts of the body, I couldn’t watch anymore. I turned to my newly made Austrian friend and asked if we could go. 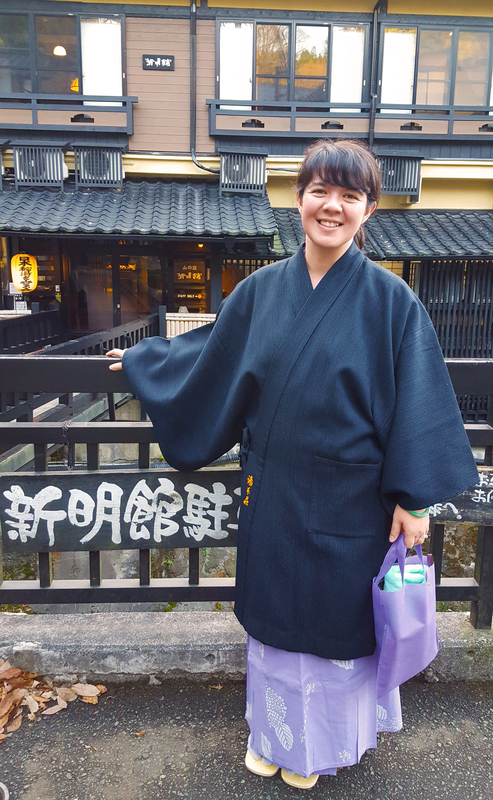 She patted me on the shoulder and smiled warmly, saying she would accompany me back to the homestay. Before leaving, I gave my own personal prayer to the young boy, and I hoped that he was valiantly riding his horse into the afterlife, with no regrets. I’ve traveled quite a bit. I’ve seen a number of strange things. To be honest, I rarely have culture shock and I’m very accepting of different cultures and traditions around the world. 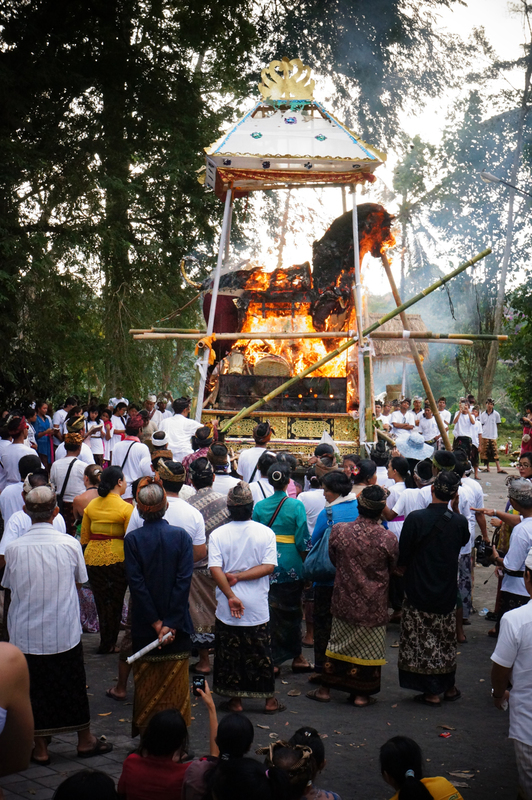 However, the funeral pyre I saw in Bali was probably the most intense moment of culture shock I’ve had. When I say culture shock, I don’t mean that I disagree with it or think it barbaric–I just mean to say, it was a complete 360 to what I’m used to in the west. Smiling and celebrating at a time of death is not only unacceptable in the USA, it’s rude. But here, it was how you gave respect to a soul in passing. And I went to sleep that night, thinking about the red horse. Thinking about that young 18 year old boy. Thinking about life, death, and how we have to cherish what we do in between.